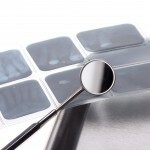 Home » Posts » Dentistry » oral medicine and pathology » External root resorption diagnosis: cone-beam computed tomography or periapical radiographs? External root resorption diagnosis: cone-beam computed tomography or periapical radiographs? External root resorption (ERR) has been defined as, he physiologic and pathologic dissolution of the mineralized tissues, including dentin, cementum, and adjacent alveolar bone, primarily as a result of osteoclastic cell activity. ERR is an adverse effect of orthodontic treatment. The aim of this review was to compare the diagnostic accuracy of cone-beam computed tomography (CBCT) and periapical radiographs (PR) for the detection of external root resorption (ERR). Searches were conducted in the Cochrane CENTRAL, Medline, Embase, China National Knowledge Infrastructure, and System for Information on Grey Literature in Europe (SIGLE) databases with no language restrictions. In-vitro studies investigating the diagnostic accuracy for ERR where artificially simulated ERR served as the reference test were considered. Study quality was assessed using the QUADAS-2 tool, but omitting 2 questions. The diagnostic accuracy of CBCT and PR was statistically pooled using a bivariate model. Meta-regression and subgroup analysis were performed to explore the sources of heterogeneity. Sensitivity analysis was used to test the stability of the overall results in the meta-analysis. 9 studies (sample 1097 ERR sites) reported on the efficacy of CBCT. 5 studies reported on both modalities. 11 studies were considered to be at medium risk of bias, 4 at high risk. The pooled results showed that CBCT had significantly higher sensitivity and area under curve (0.96; 95% CI: 0.77-0.96) than PR (area under curve: 0.88; 95% CI: 0.85-0.90). There was no difference in sensitivity, specificity, and area under the curve between conventional and digital PR was observed. This study suggests that CBCT could be reliable in detecting the presence of ERR in clinical practice, which has a higher diagnostic efficacy than PR. As the authors point out in their introduction to this review there is no appropriate diagnostic gold standard for the diagnosis of ERR in vivo so they had only included in-vitro studies in this review. All the studies have therefore been conducted on teeth where artificially created ERR is used as the reference test. Using this approach raises concerns regarding clinical applicability and although the authors suggest that 11 of the 15 studies have low applicability concerns this is still an important consideration when interpreting the reviews findings. The reviews authors suggest that CBCT could be used for diagnosis of ERR however given that the evidence for treatment of ERR is also limited (Dental Elf – 30th Nov 2015) and only a small proportion of patients suffer from sever ERR while undergoing orthodontic treatment and there are cost and radiation exposure issues relating to CBCT use more work needs to be done on the most appropriate methods of identifying, monitoring and managing ERR. Yi J, Sun Y, Li Y, Li C, Li X, Zhao Z. Cone-beam computed tomography versus periapical radiograph for diagnosing external root resorption: A systematic review and meta-analysis. Angle Orthod. 2016 Nov 4. [Epub ahead of print] PubMed PMID: 27813424.